The White Night is probably the most busy night in Tel Aviv and it attracts thousands of people from all around the country. During the night you'll be able to enjoy many concerts, shows and lectures. All the activities along the night are free for the public (including all the museums in Tel Aviv). 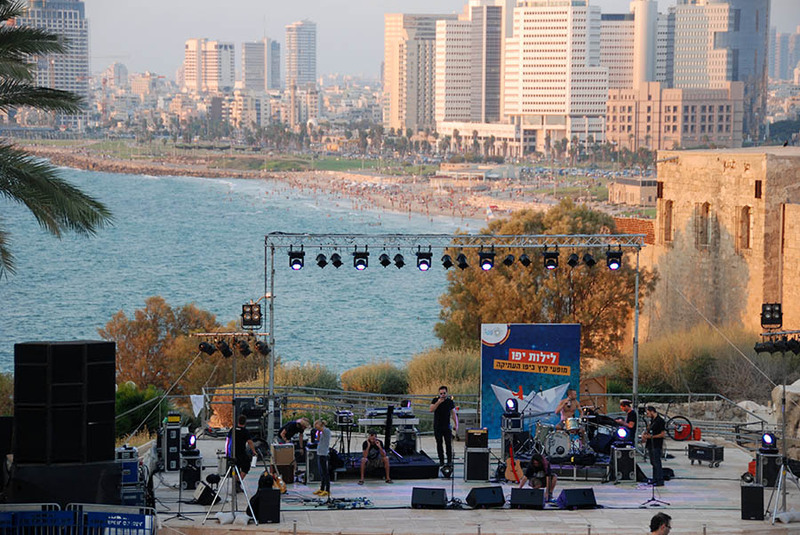 The main events will be centered around Jaffa port, Rabin Square, Sharona center, Hatachana and Kikar Habima. Restaurants and bars go out of their way to offer something special for the all-night revelers so don't be supprised if you'll see many small street parties all around the city. Here are the events for the White Night 2015. Where - Rabin Square (Kikar Rabin). View map. When - June 26, 20:00 - 23:00. Where - Tel Aviv Performing Arts Center. View map. Where - Jaffa port. View map. Where - Rotschild 1 street. View map. When - 21:00 - 24:00. Gan Hapisga, getting ready to the show. Where - all around the city. Only in Hebrew, 40 NIS p/p. For more information you can call to 03-5166188. Where - Byalik square. View map. Where - Frishman beach. View map. When - According to the games schedule. What's on your mind about this? Share your thoughts with us. Error: Email address in use! Haifa is the third largest city in Israel, the city is built on the slopes of Mount Carmel facing the Bay of Haifa with a major seaport. The Jesus Trail is a hiking route running for 65km in northern Israel’s Galilee region. The trail connects significant locations where Jesus spent time as well as religious and historical sites. When you’re trying to decide when to visit Israel you should consider the weather, the Jewish holidays and any special events you’re interested in. Oh yes, and when you are free! You’ve come for a couple of days for a vacation in Tel-Aviv, there is no doubt this city is addictive and drags you in, but besides this wonderful city Israel offers a wide range of places worth visiting. Travelling Back in Time – The Most Famous Historical Sites in Israel! There are so many things to see in Jerusalem and you might not be able to do all that you set out to do, but don’t forget that there is a lot more to see in Israel in addition to Jerusalem. The city of Jerusalem has indeed been around for a long time and has a rich historical story to tell. We welcome you to come see for yourself the place where it all began. Test yourself - How well do you know Tel Aviv? A short movie from yesterday from the Light Festival in the old city of Jerusalem. For more information about the festival you can visit the following link. So, you've decided to leave the hotel, congratulations! You will not be disappointed. Not only will it be good physical activity but also an exhilarating trip through a variety of attractions. This movie is definitely the most epic and cool safety movie ever!!! A really cool video from Haifa beach from today after the heavy morning rains. Day on Palmachim Beach - Dog's Point of View. Have you ever thought how looks the world from dogs point of view, our friend Einav took his Dog Billy with GOPRO camera to Palmachim beach. The results are so lovely. If you ever thought how looks the shore of Tel Aviv from Bird's Eye View this is your chance. Enjoy. Where Will You Eat Your Apples and Honey this Rosh Hashanah? To celebrate Rosh Hashanah, the Jewish New Year, this year, we decided to ask some of our friends... where do you eat your apples and honey? Their answers were very surprising. We just got our new drone (Phantom DJI) and did our first test flight, here are the results. Take some time and go spend time in one of Israel's nicest places, By Israel Nature and Parks Authority. Have you ever wondered how israel looks during Yom Kippur? Here is a first peek to Tel Aviv during this special day. The old city of Jaffa is the most popular spot in Tel Aviv among the tourists population. We took our new drone to fly over the old city, the results are pretty amazing. To Nimrod Fortress and the Banias - Recommended Hike Track.